Located at the corner of Yosemite and Main in Manteca. Welcome to Aksland Real Estate! 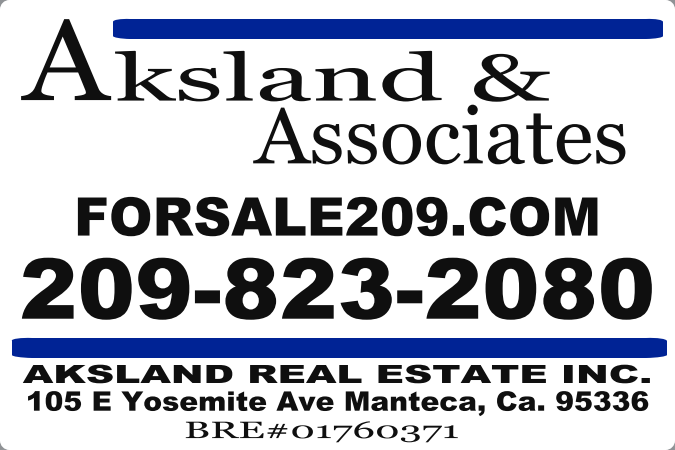 Aksland Real Estate, Inc. has been helping buyers and sellers in the Central Valley since 1981. Here you will find a wide variety of useful information and resources designed to help you buy or sell a home more effectively in the Manteca and Modesto/Stockton Metropolitan Areas. From information on the local community, to advice about finding a mortgage or preparing your home to sell, it's all available here on this web site. Closed Daily 12:00pm to 1:00pm.